Foreign Minister Prakash Sharan Mahat with Deputy Prime Minister and Minister for Foreign Affairs and European Affairs of the Kingdom of Belgium Didier Reynders in Brussels on Monday. KATHMANDU, Feb 15: Brushing aside claims from various quarters that Nepal's constitution is not inclusive, Foreign Minister Prakash Sharan Mahat has said that Nepal's constitution is the most inclusive as it encompasses the main features of a democratic and inclusive polity. Addressing an interaction jointly organized by the Embassy of Nepal and the European Institute for Asian Studies in Brussels on Tuesday, Foreign Minister Mahat said although the constitution is not perfect it has tried to ensure representation of all groups living in the country. "We cannot claim that our constitution is hundred percent perfect. But judging by any standard, it encompasses the main features of a democratic and inclusive polity," he said. Minister Mahat said while state policies are aimed at uplifting the overall status of socially backward groups including women, Dalits, Adibasi Janajatis, Madhesis, Tharus and other minorities, separate Constitutional Commissions have also been established to protect the rights of these marginalized communities. He also mentioned that concrete measures have been devised to promote inclusive representation at all levels of governance. "The Constitution has legal provision to guarantee at least 33 per cent participation of women in the federal parliament and at least 40 per cent at all political bodies at provincial and local levels. As a concrete step toward inclusive state structure, the constitution provides that while conducting election of the President and Vice-president, the election shall be held so as to represent different gender or communities," he further said. The minister also mentioned that there is a provision to elect a woman to either speaker or deputy speaker post and the legal provisions ensure that 45 percent of the vacancies at all government services is allocated for minority ethnic groups and women. "With these provisions in place we have already seen the impressive result in the process of inclusion. Already as we are in the midst of implementing the constitution in its entirety, Nepal has witnessed a visible transformation across the sections and strata of society," he added. 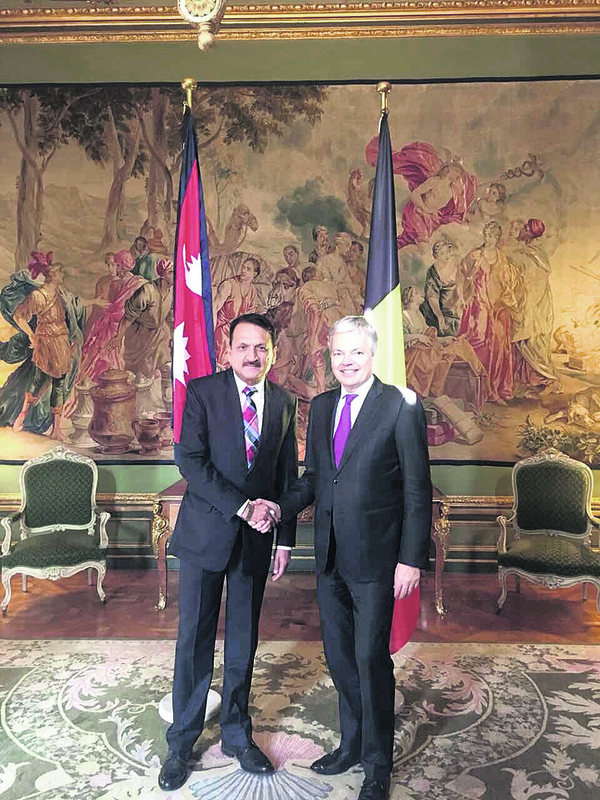 On Monday, Minister Mahat held a bilateral Meeting with Deputy Prime Minister and Minister for Foreign Affairs and European Affairs of the Kingdom of Belgium Didier Reynders at the latter's office in Brussels. The two foreign ministers agreed on establishing a bilateral consultation mechanism between the two foreign ministries as well as on having parliamentary friendship groups in the parliaments of Nepal and Belgium, according to a press statement issued by Embassy of Nepal in Brussels. During the meeting, the two foreign ministers discussed a wide range of issues pertaining to Nepal-Belgium relations including development cooperation, trade, investment and tourism. While expressing satisfaction over the excellent state of bilateral relations between the two countries, the two foreign ministers stressed the need for strengthening relations through enhanced cooperation and collaboration.